White Kirsch drapery traverse rod and plain rod combination. 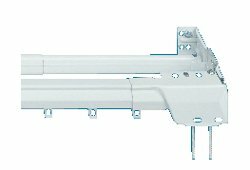 All rod can be ceiling mount drapery rods or wall mount. Curtain hardware rods by Kirsch. Two way draw, split draw, center open Kirsch drapery rod, includes mounting hardware. 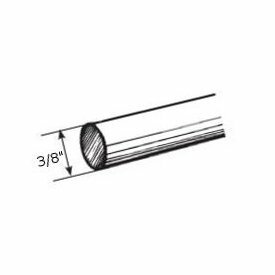 Superfine Traverse Rod is the workhorse for durable installations. Superfine Traverse Rods include drop in brackets, supports and cord tension pulley for installation. Made from heavy gauge steel with a baked enamel finish. Exclusive Kirlon on all sliding surfaces. Push in brackets and extension plates are available as an option. Only the finest pulley sets are used. Strong and durable with a slide gate for easy removal of extra slides. Long wearing, stretch resistant polyester cord and continuous lacing for use at either end or to convert to a one way draw. Priced Each, select adjustable width below... 3263025 30" - 48", ￼ 3265025 48" - 86", ￼ 3267025 86" - 150", 3268025 100" - 180"